Not Even a Bag of Sugar: Why Choose the Pixie Harness? Why Choose the Pixie Harness? Last week I introduced you to the Pixie Harness, this week wanted to tell you a bit more about it and how it works. So what’s the issue with a standard seatbelt? A standard seatbelt is designed with the safety of the driver or passenger in mind, but not necessarily the unborn baby. As I see it there are two pressing issues. The first is that there is a specific way of wearing a seat belt in pregnancy. 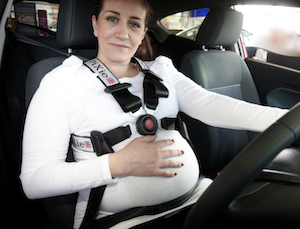 Professor Serpil Acar found that 87% of women wore their seatbelts incorrectly in pregnancy. Also an issue, and one that Steve, the creator of the Pixie Harness picked up on, is the area of non-compliance of pregnant women in wearing seatbelts. Pregnancy is not a comfortable time, and many women have issues such as symphysis pubic dysfunction, and thus experience pelvic pain, and it can be tempting to not wear a seatbelt, especially on short journeys. However, not only is it illegal, this practice is dangerous. A little bump in a carpark that we may not think twice about, can have a devastating impact on the developing baby inside. Why the Pixie? 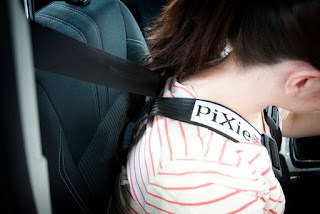 There have been a few attempts to make seatbelts more comfortable in pregnancy, however the Pixie is quite unlike anything that has been seen before. In addition, it meets all safety regulations for both the UK and Europe, unlike the other “solutions” out there. 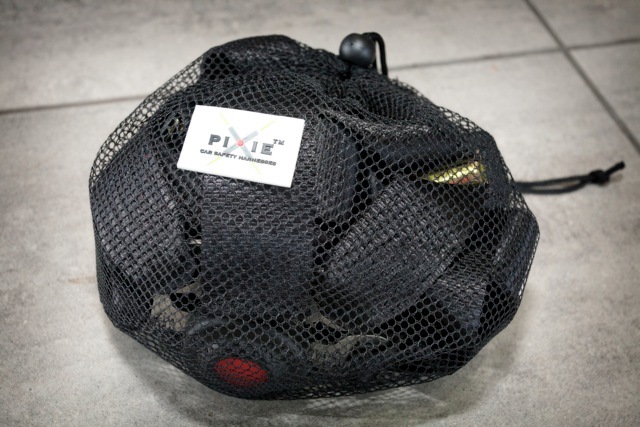 Having worked extensively in the disability field, I have first-hand experience that 4 point restraints are the safest method of keeping a person secure in a moving vehicle, whether it be a car or a wheelchair, and this is just how the Pixie is designed. To me, it makes perfect sense, once your baby is born, it will spend the first couple of years of its life being secured in such a way, whether in a car or a pushchair. How does it work? Does it need to be professionally fitted? The Pixie is so convenient. The harness is fully adjustable to your shape, and is fitted on to the standard seatbelt, so no mucking about with taking your car into a garage. It’s much easier to use than say a standard group 1 car seat! It can then easily travel with you (and to that end comes in its own mesh bag) so that you can take it with you if you are travelling with friends, or in a taxi. The way the Pixie protects the unborn baby is that in an impact, the force is spread throughout the upper body, and completely away from the developing baby and placenta. The vertical of the seatbelt goes through the back of the Pixie in a metal clasp, so it is this that prevents you from going too far forward. You can see more about how to fit the Pixie here. Why I love the Pixie Harness: Steve is a problem solver. He saw the potential and very real problems of seatbelts in pregnancy and he sought a technological solution to solve it. Steve investigated this thoroughly, and has ensured the device complies with all the European and UK regulations in this area. He has literally thought of everything, down to the carry bag so that you can easily gather it up and move it from one place to another. When I went to see the device I was so impressed with its design, its comfort and its ease of use. It really is an amazing piece of technology and I think, as women and as mothers, we are fortunate to have people like Steve thinking of us and finding solutions. I’m also proud that this device was conceived in Bury, further proof that Manchester is leading the way in innovation and safety. If you have any questions, please post them here, on Twitter or the Facebook page.